All around Turkey, there are these adorable little 'gazebos' or terraces that you can take your shoes off, go inside and lay up against tons of comfortable pillows. The tables are low, and you're essentially sitting on the floor on top of pretty Turkish rugs and cushions. It makes for the perfect venue for catting with friends, eating or smoking nargulay. I was inspired by these little gazebos to make my flat a little more 'lounge friendly'. I have an ugly, stiff couch and chair set in my flat, and efforts were made to cover up the ugliness. But one night, Laurel and I discovered how comfortable our couches can be when they are made into sofa-beds and have tons of pillows piled at the back. That night, we decided we needed cushions to turn our couches into comfortable day beds. I was inspired by the pretty blue patterned cushions I saw in Olympos to make my appartment both pretty and comfortable. Laurel, Colleen and I went to the market in Ulus to try to find our cushions. I must say how much I love Ulus. It's the oldest part of the city, and it kind of shows. But, Ulus is where you can get the most delicious börek, lokum and baklave, in addition to very cheap household goods. The streets are narrow and windy in Ulus, and it's usually quite crowded, with vendors calling out, advertising their goods, people selling simit and corn on the cob (street food, in this area of the world) and plenty of hustle and bustle. 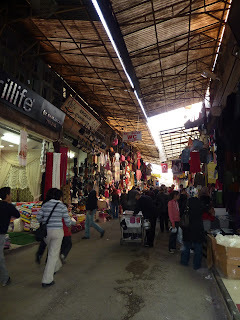 There is a very long street in Ulus that sells mostly clothes and cloth, so we headed there. I saw pre-made cushions similar to what I saw in Olympos, but we kept looking. We found giant, thick, patterned pillow cases in a fabric shop. 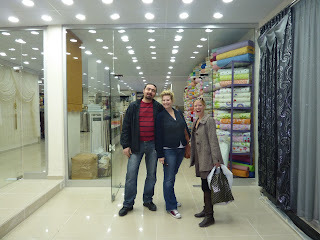 They were 15 TL each, so Laurel and I each bought 3 and negotiated buying the 3 for 40 TL. We like to try to work on our bargaining skills whenever possible because it's common to bargain in this country. Prices are not listed, you must ask a shopkeeper what the price is. It is possible that the price could be raised, considering we are foreign and do not speak the language, so we do try to bargain with vendors where ever possible. Ulus Textiles! Laurel and Colleen with one of the friendly shop keepers. We got our cases and took them to a lovely store aptly named Ulus Textiles, where the shop owner spoke perfect English and we asked him to make cushions to go inside the cases. 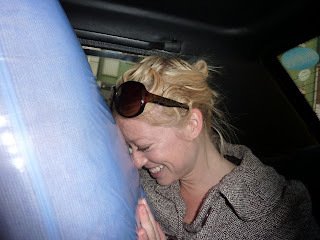 Colleen managed to find pillow inserts, so it was just Laurel and I who needed to have our pillows stuffed. 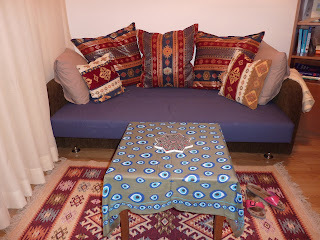 We negotiated 60 TL for the 6 pillows, down from 70 TL and arranged for our pillows to be ready in an hour. I also bought thick, navy blue fabric to cover my ugly couch and chairs and go with the blue theme I have going on in my flat. It was 34 TL for 4 metres and I had more than enough to cover my furniture. We took a taxi home and all began re-arranging our furniture. I covered my couch and chairs and arranged my pillows. We ran from appartment to appartment to check out the transformation in everyone's living room. Voila! A gorgeous, comfortable lounge bed with pretty Turkish patterned textiles.